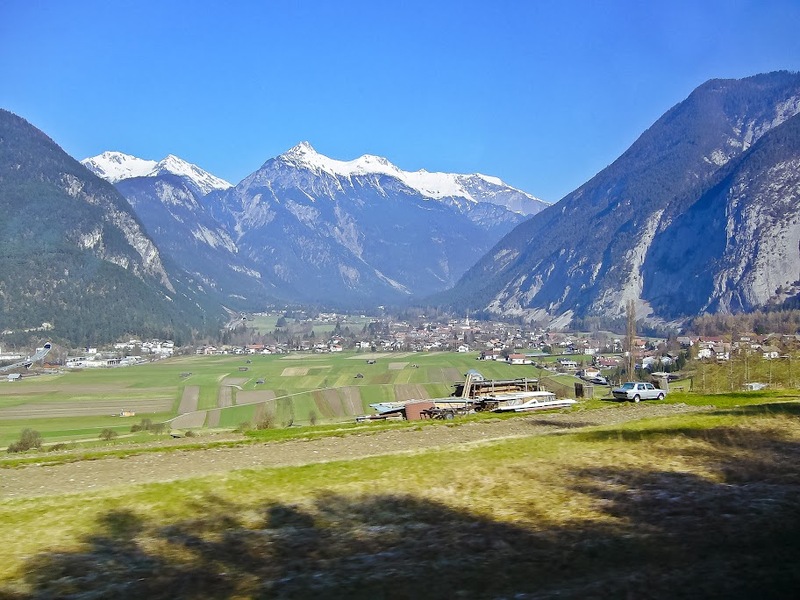 This is the long-delayed final installment of my series looking back at my very first Eurotrip in 2007, during which I visited Germany, Austria, and Switzerland. I never kept a journal during that trip so I am writing this mostly from memory. All photos were taken with my old pocket camera. 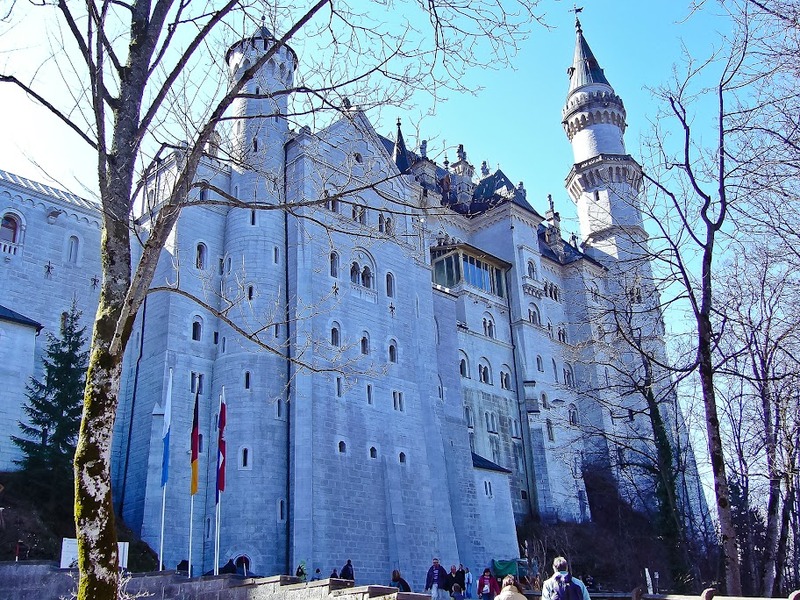 After spending a final evening in Salzburg we departed early the next morning for Bavaria, where we would be visiting Neuschwanstein, King Ludwig II’s famous fairy tale castle. Along the way I took some photos of the pretty countryside. River near a rest stop. 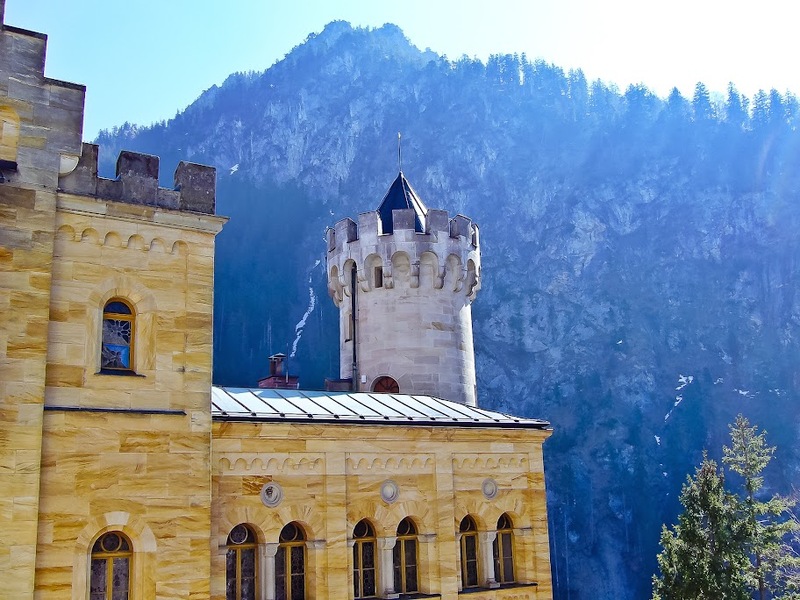 We soon arrived at Hohenschwangau, where I took this photo of Hohenschwangau Castle, King Ludwig II’s childhood home. We didn’t have time to tour this castle. From here we began a long walk up a steep hill to visit Neuschwanstein. An optional bus or carriage was also available to take you to the top, but most of us chose to walk. Our first view of the castle. Front entrance with coat of arms. 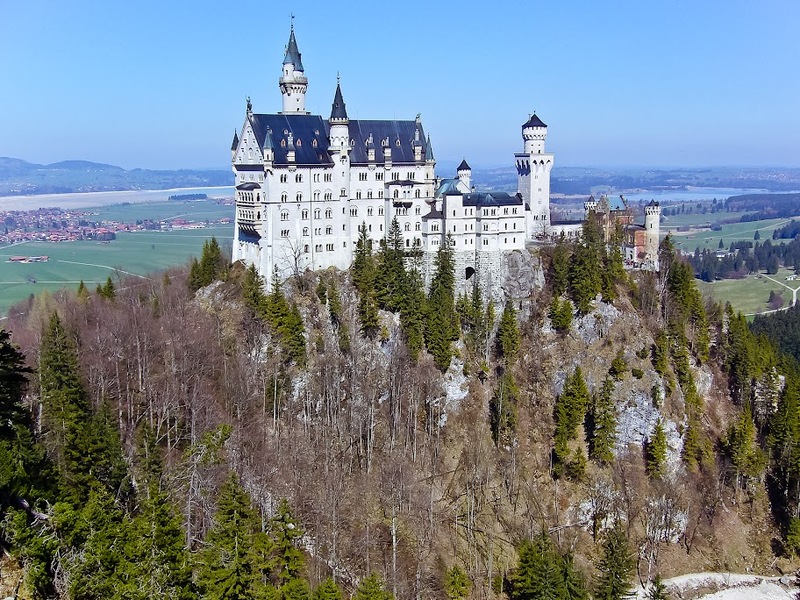 Neuschwanstein was the inspiration for the Sleeping Beauty castle in Disneyland, whereas the Cinderella castle in Disney World was based on any of a number of different European castles, depending on who you ask. The castle was already an anachronism when it was built–the first skyscrapers were going up in New York around the same time. 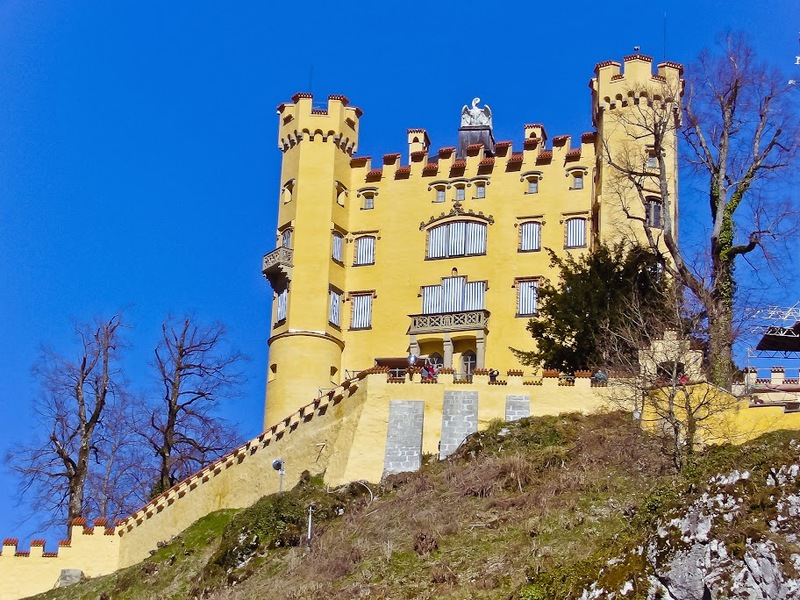 Ludwig II was also known as “The Mad King” or the “Fairy Tale King.” He was eventually declared insane and deposed, but now Bavaria makes millions from his palaces. 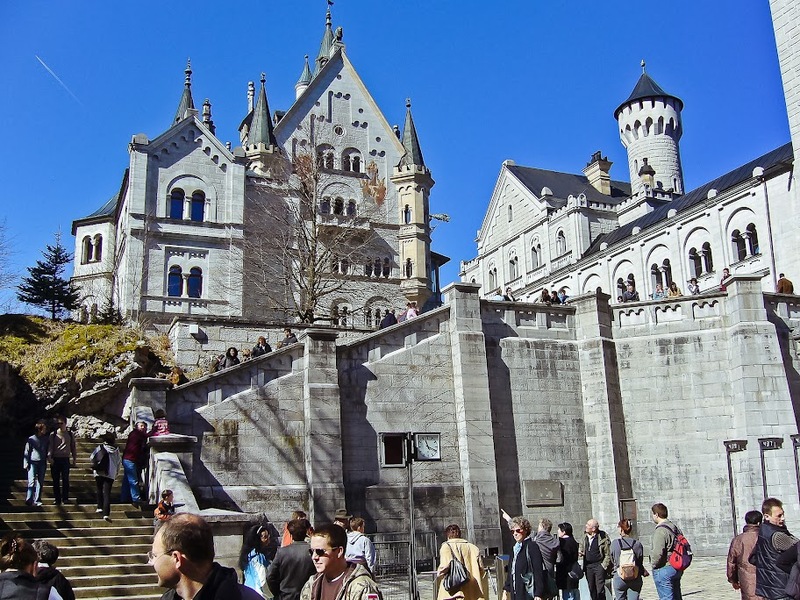 Ludwig II was fascinated with fairy tales and Wagner operas, both of which feature prominently in the castle’s design. The inside is quite spectacular, and even includes an artificial cave. Unfortunately no photos were allowed inside but you can find pictures of many of the rooms online. One word of advice: if you’re looking buy some souvenirs after completing the tour, avoid the first gift shop–things are cheaper in the second gift shop . . . and even cheaper in the shops at the bottom of the mountain, at least that was the case back in 2007. 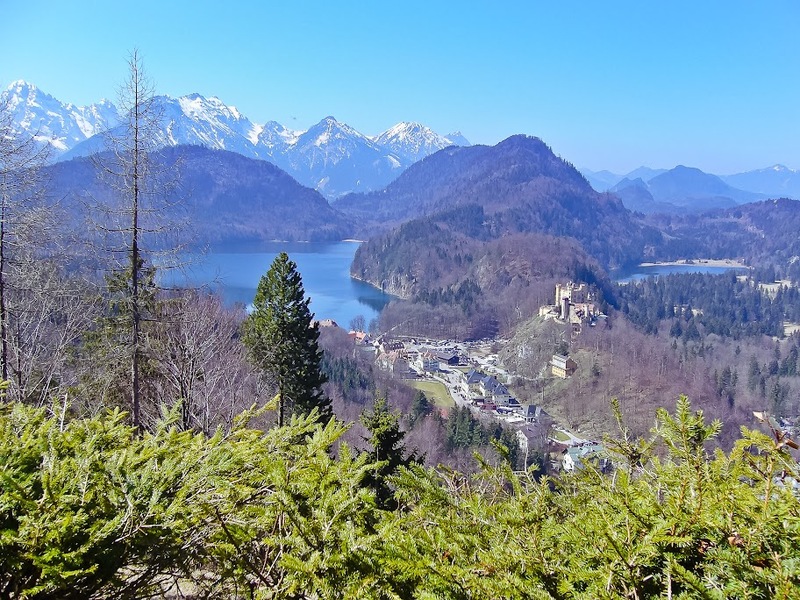 Hohenschwangau Castle is visible in the distance to the right. From the Marienbrucke you can enjoy one of the iconic views of the castle, seen below. The other famous view, from the front, requires a hike up to the top of a nearby mountain, which we did not have time for. 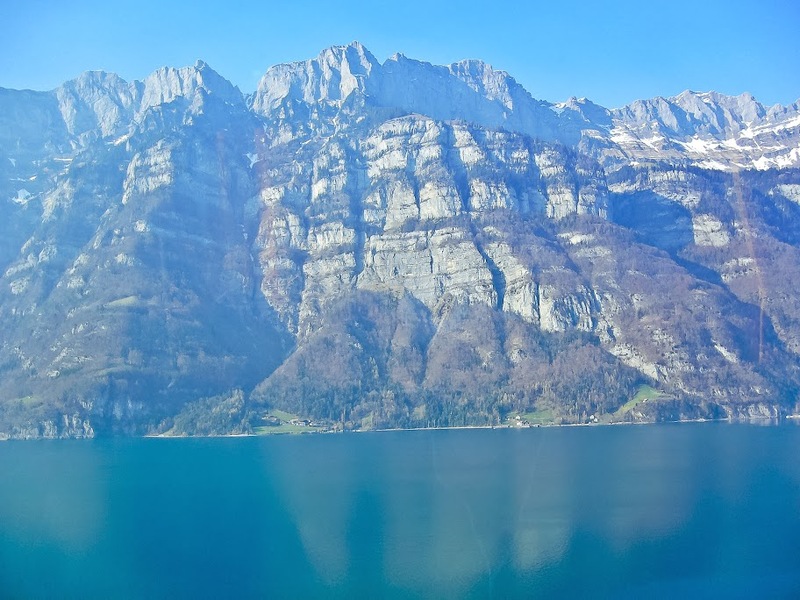 After our visit to Neuschwanstein it was time to head to Lucerne, Switzerland. 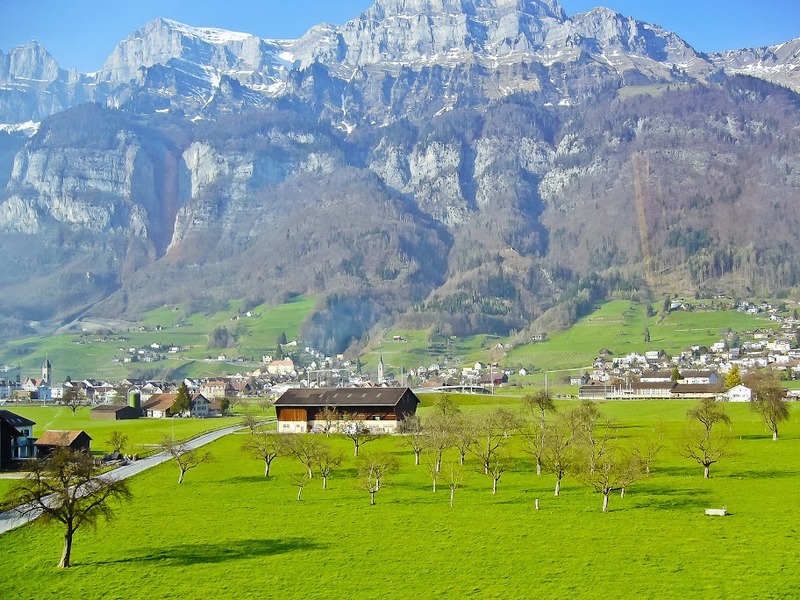 Along the way we were treated to gorgeous views of the Swiss countryside. Another view from the bus. This huge lake went on for miles. 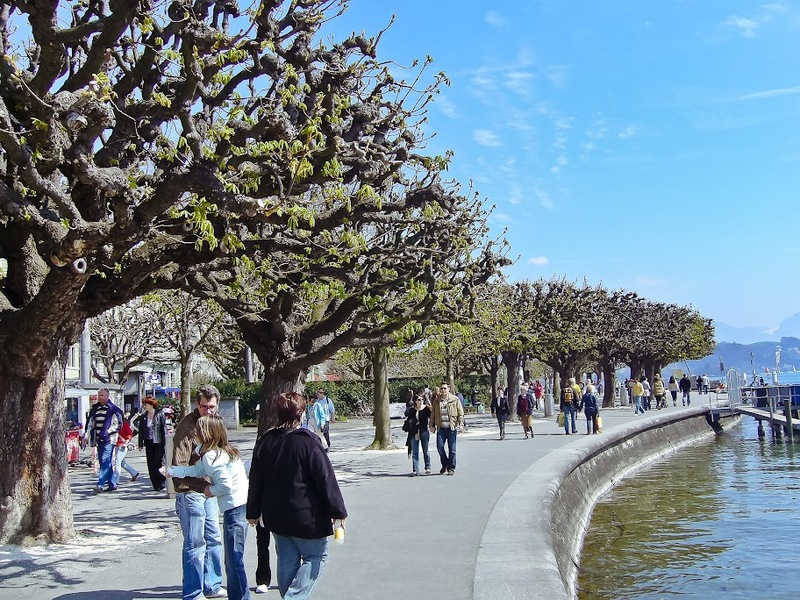 Lucerne is reminiscent of some seaside resorts in the States, but with more historic architecture. Despite being a major tourist spot (complete with casinos) and one of the more expensive destinations in Europe, it is one of my favorite European cities. 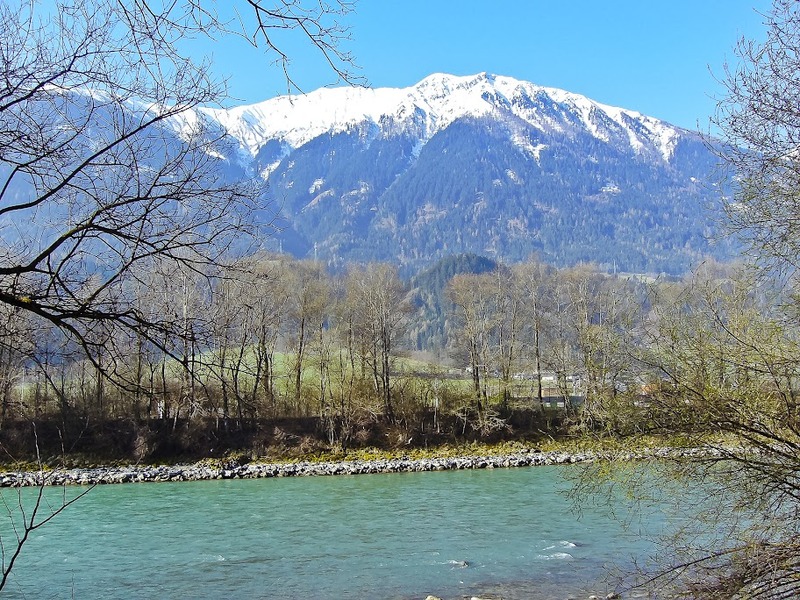 The views along the lake with the Alps in the background are simply breathtaking. 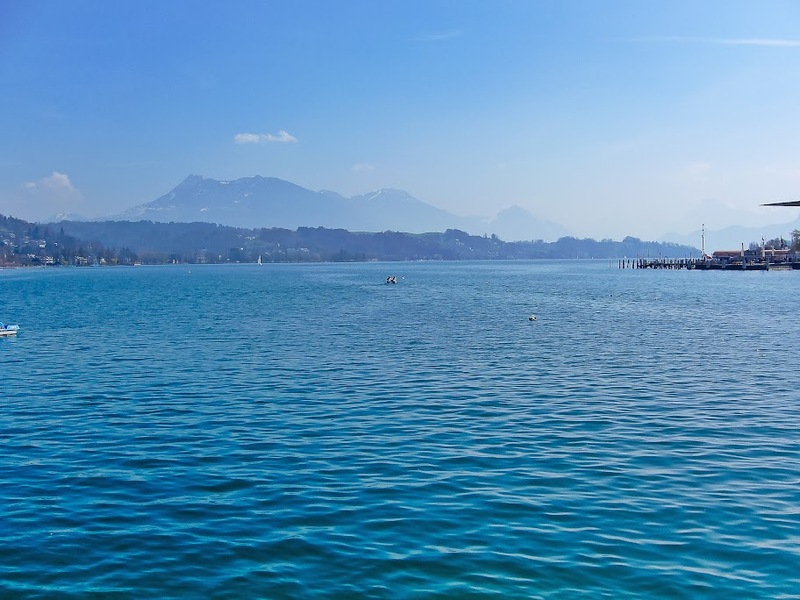 A portion of the Lucerne shoreline. 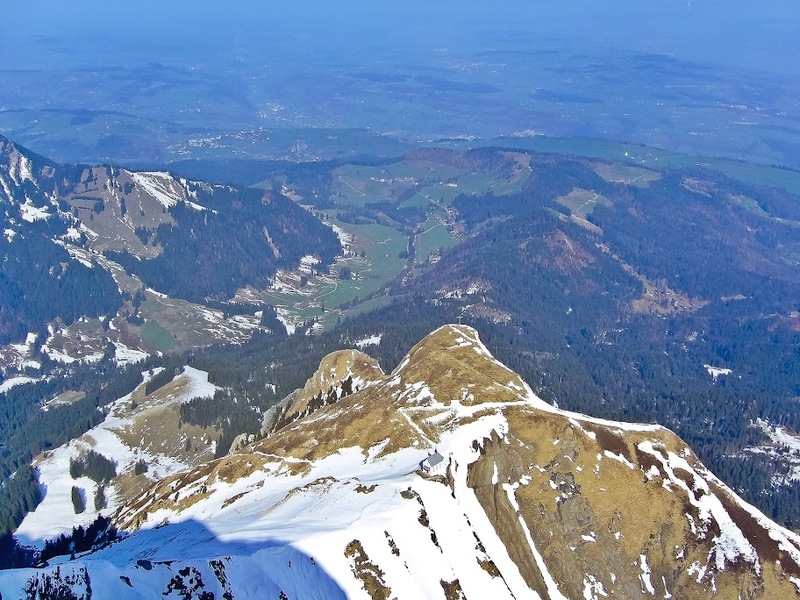 No trip to Lucerne is complete without a visit to Mount Pilatus, the large mountain that looms over Lake Lucerne. 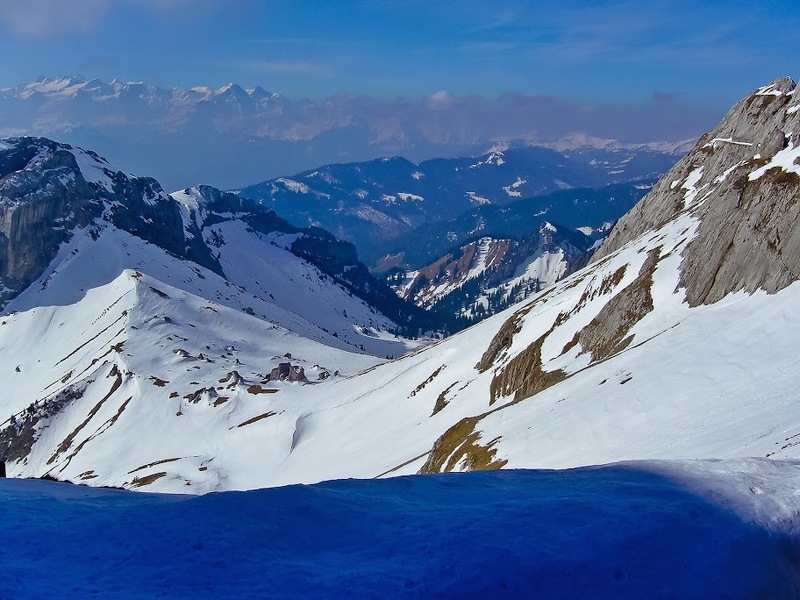 Mount Pilatus dominates the landscape. 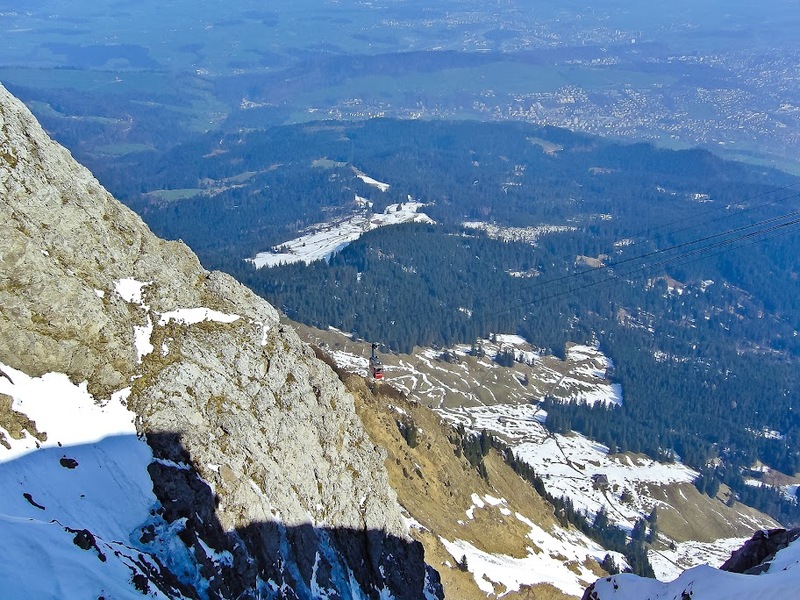 To get to the top of Mount Pilatus you take cable cars, from which you can watch the terrain turn from grass to snow as you ascend. First the grass . . .
. . . and then the snow. After a while you exit your comfy small cable car and transfer to a large one, where you must stand, packed in with as many people as they can fit. The larger cable car making its final ascent. 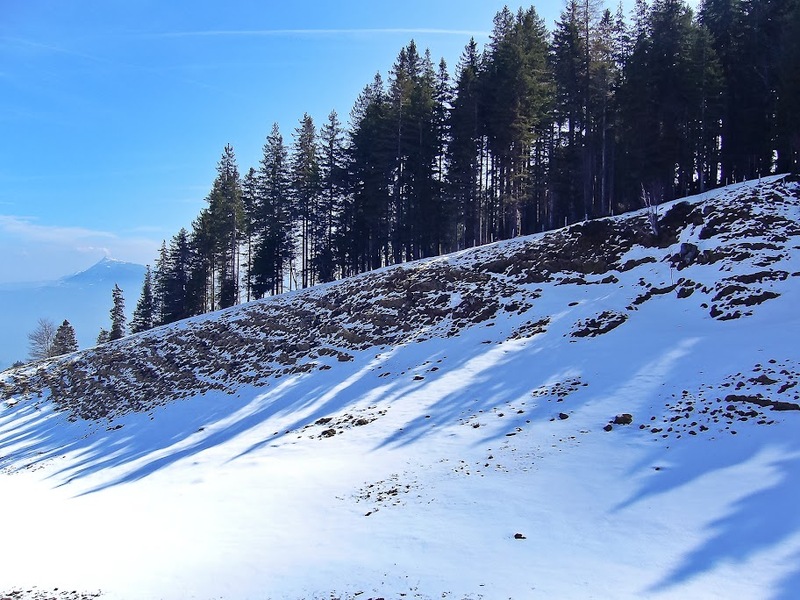 Once you reach the top, the views defy words, so I’ll let the photos do the talking, even though they could never do justice to the sensation of standing there in person. 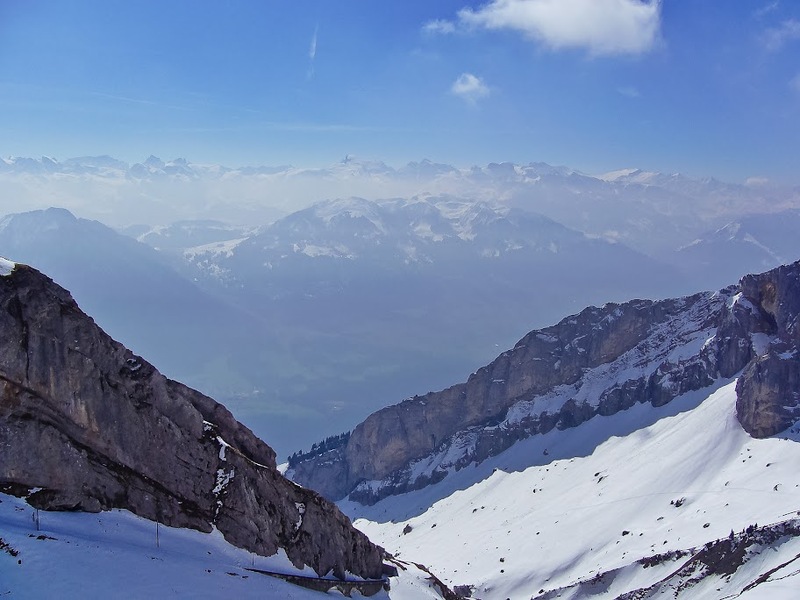 On top of Mount Pilatus. Some day I would like to return with a better camera. I wonder how you get to this church . . .
To get down, we took the same cable car route, though apparently you also have the option of taking some sort of railroad ride down. My uncle and I went to a restaurant on a boat for lunch, where we split an order of quite expensive fondue–54 francs for what was basically bread and melted cheese. I wasn’t kidding when I said that Lucerne is expensive. I spent the rest of the day exploring the city on my own. 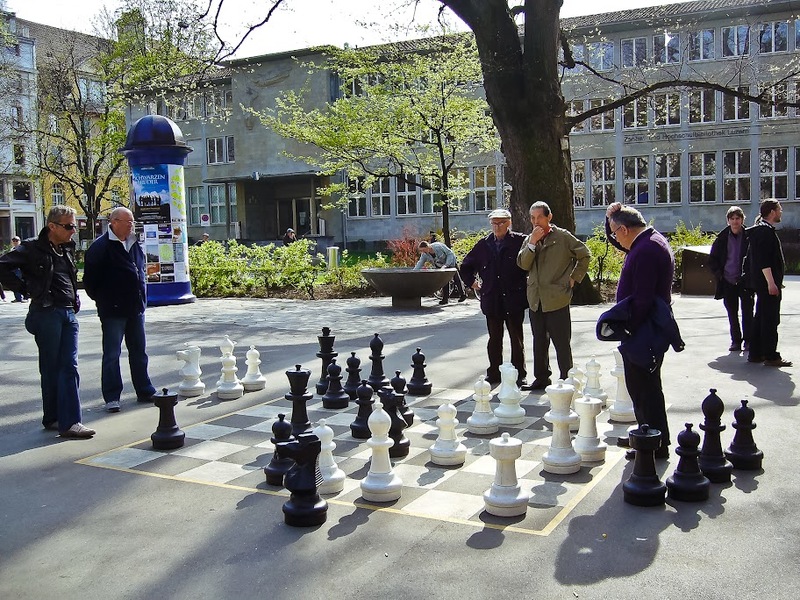 In my travels I encountered another giant chess board like the one in Salzburg, though I didn’t play on this one. I had planned to do some shopping later in the day, but everything in Lucerne closed at 4pm . . . on a Saturday! Instead I just meandered and soaked in the beauty of the city. 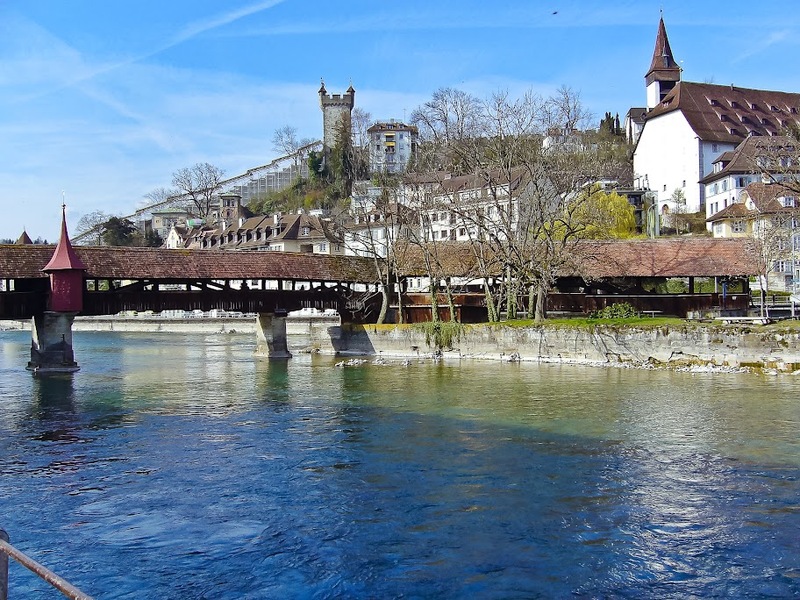 One of Lucerne’s famed covered bridges . . .
At one point I encountered a group of women having some type of bachelorette party scavenger hunt. The bride (dressed as a prisoner) had a list of things she had to do, one of which was to dance with strangers on camera. She tried to get me to dance with her, but I sort of just stood there and talked to her while she danced around me and her friends filmed it. The next guy (pictured with the girls below) was much more game and really got into the dancing. 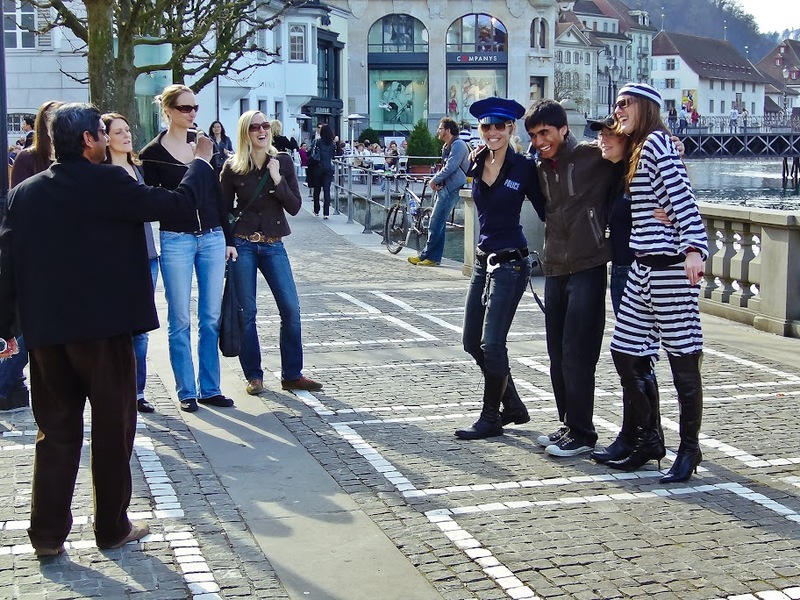 Somewhere in Europe there’s a video of this prisoner dancing around me. As the day wound to a close, we visited the famous weeping lion monument and posed for our final group photo. We had to wake up at 4:15 the next morning to hop on the bus to Zurich for our flight out, so we called it an early night. 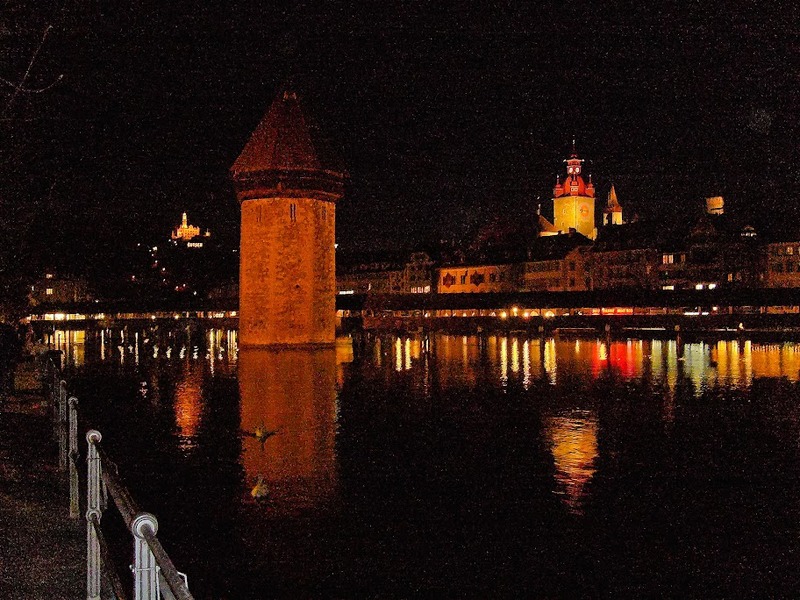 I got searched again at the Zurich airport (seemed to be a theme on this trip) and then we flew to Frankfurt for a five-hour layover before finally boarding a plane for the States. 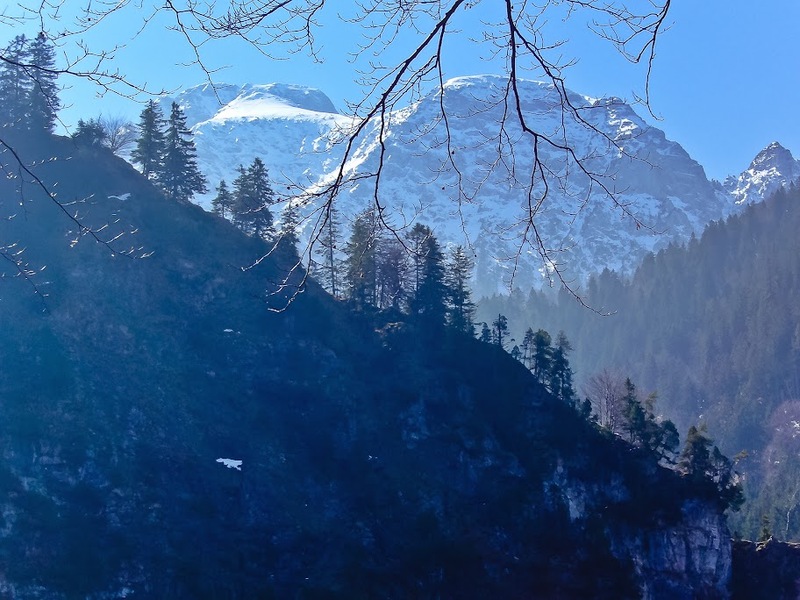 I had come down with a cold on my last day in Europe, which did not make for a pleasant flight—apparently my inner ear passageways swelled up and prevented my ears from popping—my left ear still hadn’t popped a week after I returned home. Despite the dubious ending to the trip, it was a life-changing experience, and the travel bug bit me hard. Prior to this trip, the idea of traveling the world had never even been on my radar. I spent the first 36 years of my life barely venturing from the east coast of the United States, but in the 7.5 years since, I’ve embarked on three more Eurotrips, as well as trips to Peru, Mexico, and California . . . and it all began with this trip back in 2007.